At 12:30 pm on Tuesday, September 15, a brilliantly sunny day, we hosted a ceremony in front of 41 Cooper Square to officially dedicate The Cooper Union’s amazing new academic facility. It was a glorious event, with brief speeches by college and government luminaries followed by the cutting of a bright green ribbon (in keeping with the environmental friendliness of the building) and cannons shooting confetti in the college logo’s colors over the assembled crowd. Afterward,more than 100 major donors and friends enjoyed an alfresco lunch on the eighth-floor Alumni Roof Terrace, while many faculty and students joined in a festive picnic in Peter Cooper Park. 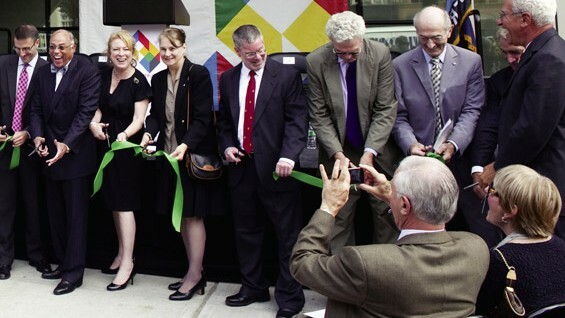 The ribbon cutting ceremony was an important milestone in the college’s rich 150 year history. Segments spotlighting the event aired on WABC-Ch.7 morning news and WCBS-AM radio; an Associated Press article ran on the wire and was featured in local papers from Vermont to Pennsylvania. On Tuesday, September 22, 2009, Trustee Sandra Priest Rose hosted an event to dedicate the Frederick P. Rose Auditorium in 41 Cooper Square. Created as an opportunity to introduce her family, friends and colleagues to The Cooper Union, the event drew more than 150 guests who enjoyed cocktails in 41 Cooper Gallery and tours throughout the building led by students, faculty members and project managers from the F.J. Sciame Construction team. President George Campbell Jr. welcomed guests and spoke about the importance of the Rose family’s generous support of the college. Dean William Germano of the Faculty of Humanities and Social Sciences talked about his wonderful experiences teaching in the auditorium.Mrs. Rose’s son Jonathan Rose, whose firm served as Cooper Union’s owner’s representatives during construction, spoke poignantly about the meaning of naming this special space for his late father. To commemorate the moment, President Campbell presented Mrs. Rose with a signed copy of 41 Cooper Square architect Thom Mayne’s book, Morphosis: Volume IV (Morphosis; Buildings and Projects). If you’re interested in naming a seat in the Rose Auditorium, contact Claire Michie at 212.353.4171 or michie@cooper.edu. On Saturday, September 12 more than 250 alumni and guests raised a champagne toast to open the Alumni Roof Terrace on the eighth floor of The Cooper Union’s latest facility, 41 Cooper Square. The Alumni Roof Terrace is a special place in the new building which honors The Cooper Union’s alumni and supporters, both past and present. To date, 500 names are engraved on the Alumni Roof Terrace, raising more than $2.175 million for the Building Fund. With room for 150 more alumni names on the terrace, we have officially reopened the opportunity to secure a place in Cooper Union history—if you’d like to join your fellow alumni and have your name inscribed on the Alumni Roof Terrace please contact Claire Michie at 212.353.4171 or michie@cooper.edu.